The other night I watched one of my favorite Voyagers. (I'm apparently into a whole string of favorites lately. It can't be helped. Season six is amazing.) Anyway, it was "Blink of an Eye." 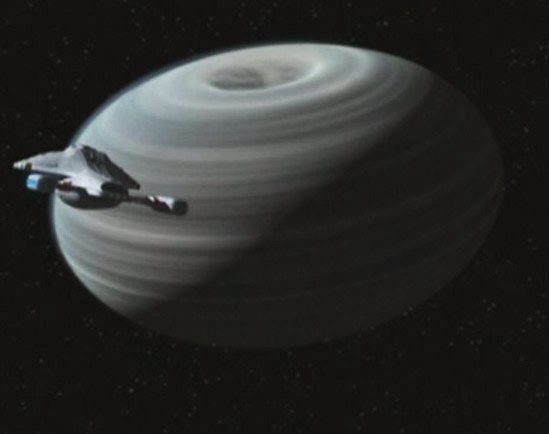 In this one, Voyager comes upon a planet spinning way, way too fast. They try to go in for a closer look but get caught in the planet's gravitational field and wind up becoming the planet's freaking third pole. This has some serious consequences--humanoids all over the planet can now see Voyager (like a twinkling star in the sky) and their presence is causing dangerous earthquakes. Because the planet is sort of displaced in time, they're moving way faster than the rest of the universe. A humanoid culture progresses from neolithic levels to a space faring society in what amounts to only days on Voyager. And (from the natives' perspective) the twinkling star is there the whole time--influencing the culture without even realizing it. Eventually, the natives realize that it isn't a star but a "sky ship." It's speculated that the Sky Ship is full of people and those people (called Sky Ship Friends) are dreamed about by children the world over. 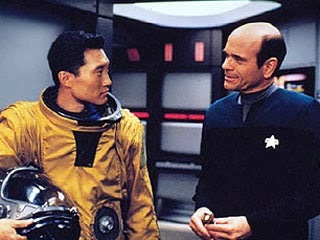 Eventually, an astronaut--Gotana-Retz--makes it aboard Voyager and, in one of the most touching scenes of the whole series, he tells Janeway about how the very first memory he has is of a Skyship mobile, which hung over his cradle. The Sky Ship and the Sky Ship Friends have been part of his whole life and now here he was, talking to them. It's a surreal moment for Retz. What I'm saying is: I get Gotana-Retz. Meeting your childhood idols is surreal and surprising. It stirs up strange, unexpected emotions. Like Retz, I got lucky and had great experiences and, also like Retz, as much as I liked hanging out with the people I'd fantasized about for years, in the end, I just wanted to go home and tell other people about the Sky Ship, about my experience with it, and about how important it is to our culture, how the Sky Ship serves as an inspiration to millions to reach for the stars. This is a beautiful episode. Isn't it? Every time I see it, I'm impressed by how well done it is. You are so lucky to have actually spent time with and gotten to know a couple of the actors. I went to a Trek convention in Hollywood, 2004 celebrating James Doohan who was in last stages of Altzheimer's, and there were many of the original cast and TNG stars there to honor him... but the lines were so long and I was too shy when I did meet a few of the actors. Now I regret the chance to ask some meaningful questions and make more particular compliments. Oh wow, I would've loved to meet James Doohan. I've heard he was such an amazing, kind person. I love this ep. Such a unique story & so well done. Yes! I love this one. I did meet James Doohan briefly. When Star Trek IV was out, I was driving home from college and heard on the radio that he was at a nearby mall. I was buying and collecting individual original series episodes on VHS then, so I whipped into a store and bought "Wolf in the Fold." Then I got in line, hoping he would sign it. When I got to him, he told me he couldn't, because if he did it for me he'd have to do it for everybody. I understood. So I just blathered something stupid, thanked him, and moved on. He was nice though, and shook my hand. A few years later when Star Trek VI came out he was in town for some reason and booked as a guest to be on our morning show (I work at a local TV station). I didn't want to wake up early and be a creepy stalker, so I gave the tape to our anchor and asked if she could get him to sign it. Then I also offered to write some interesting questions for her--better than the usual stuff that they've answered a hundred times. I recorded the interview and watched it later that day. As expected, he's tired, and the questions are bland and old. Then, about halfway through, she switches to mine. I knew he had just gotten some honorary engineering degree from some college and she asked about that. He immediately perked up and got a spark in his eye. He talked about his love of inspiring engineering students. There were some other questions that departed from the tried and true, and he answered them with gusto. On Monday, I returned to work and found the VHS taped on my desk. Signed.